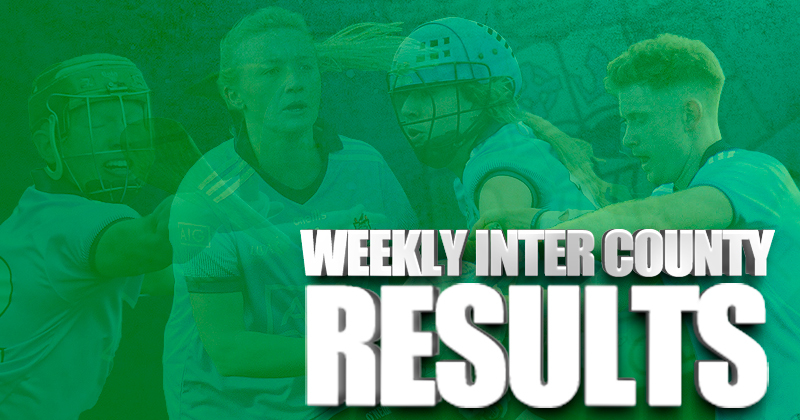 Some cracking displays and some interesting result from the opening round of the Dublin Senior 1 Football Championship. Since early in the week the action has been thick and fast in this, the Senior 2, Intermediate and Junior competition. But here are the results and details from the Senior 1 Championship. Reigning champions Kilmacud Crokes had to summon all their resources to fend of a battling Ballymun Kickhams yesterday evening. Trailing by four points, 1-6 to 0-5, at half-time Ballymun threatened on a few occasions in the second half. But on every occasion Crokes responded to protect their advantage. No player was more influential in this aspect than Dublin senior Andrew McGowan, who apart from kicking three fine points, drove his side forward when required. An impressive Na Fianna were too good for St Sylvester’s in yesterday’s Group 1 encounter at Parnell Park. Though playing into a stiff breeze in the opening half the St Mobhi Road men laid the foundation for their 14 point win with some enterprising football. Dessie Farrell’s side moved the ball with pace and precision and by the break had built up a 2-8 for 0-5 cushion. 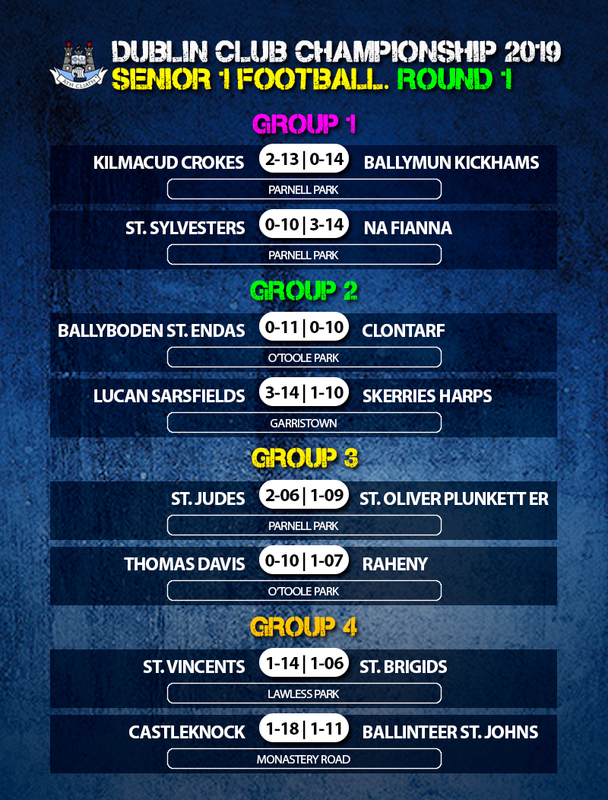 Na Fianna will now face Kilmacud Crokes in two weeks’ time while Sylvesters will play Ballymun Kickhams. Lucan Sarsfields kickstarted their Group 2 campaign off in impressive fashion with a 0-10 victory over Skerries Harps on Friday night in Garristown. Brendan Gallagher chalked up a personal tally of 2-09 (7f), both goals coming in the last ten minutes. Sarsfield’s defender Alan Murphy had an impressive game, given the difficult marking assignment of curtailing Skerries’ dangerous inside forward Stephen Smith, he emerged with much credit. Skerries made the better start and hit two early points inside the opening three minutes before Brian Collopy’s 11th minute goal ignited the Lucan challenge. They continued hitting six unanswered scores . Harps battled back to 1-08 to 0-05 at the break and midway through the second half grabbed a goal scored by sub Ciaran Murphy. But Lucan fended off any chance of a late Skerries resurgence. Elsewhere Ballyboden St. Endas and Clontarf played out a very close finish, with Boden securing the points, winning by the minimum. This wins sets up a Round 2 tie against Lucan, with Clontarf and Skerries facing each other in the second game. A Bernard Brogan free in the first minute of additional time salvaged a draw for Plunkett’s in Wednesday night’s Group 3 game in Parnell Park. The Dublin senior veteran won the free himself and angled over from 30 metres in the opening clash of a Group that also includes St Vincent’s and St Brigid’s. Brogan finished with a tally of 1-5, including five frees, some from long distance or tricky angles. St Jude’s had the opportunity to seal victory in the 59th minute when second half sub Simon King covered good ground to get on the end of a move but his one-on-one effort was well saved by Plunkett’s keeper Padraig Brennan. Another stalemate ensued in the second Group 3 game as Thomas Davis and Raheny played out a 0-10 to 1-07 draw. We’ll see what the round 2 draw looks like and let you know. The majority of last night’s crowd in Lawless Park may have gone to see Diarmuid Connolly line out for his beloved St. Vincents, but it was Mossy Quinn who stile the limelight. Continuing to defy his age, Quinn’s tally of 1-08 on the night helped Vincents see off St. Brigids in a great competitive opening fixture for both sides. And at full time it was the men from Marino who came away with the point, finishing comfortably by an 0-08 margin. Castleknock got their Championship campaign up and running on Wednesday night with an impressive 0-07 victory over Ballinteer St John’s at Monastery Road. A second quarter scoring surge put the Knock on the road to victory when they kicked six points without reply. Tommy McDaniel was the driving force for the D15 side during this period as he slotted over four points, with Seamus O’Carroll and sub Darragh Warnock adding the others as Castleknock moved 1-16 to 1-9 clear. Late points from Warnock and an O’Carroll free put further distance between the sides.